Please note that we do not ship to Canada at this time, thanks! This high-quality hardback book is a limited edition of 5000 copies. It is sure to become a collectors item amongst serious whitetail hunting enthusiasts. Alan Foster – A regular contributor to North American Whitetail magazine in the late 1980s and early 1990s, Al’s material in this book is his first in nearly 20 years. Adam Hays – Likely the only bowhunter to have killed 3 whitetails scoring over 200″! Steve Lachenmayr – Whitetail habitat guru who was named Illinois wildlife conservation landowner of the year in 2007. Joe Lieb – Accomplished all-around Iowa outdoorsman with multiple BnC archery whitetails. Lee Mitchell – The best public-lands whitetail hunter I ever met, bar none. Mike Mitten – Traditional bowhunter extraordinaire and co-producer of classic videos Primal Dreams and Essential Encounters. Gerald “Gabe” Shaffner – Has more bucks listed in the Illinois big buck recognition program than anyone. Gabe’s chapters in this book are his last contribution to the whitetail hunting community as he passed away only a couple of weeks after writing his chapters. Barry Wensel – An accomplished whitetail bowhunting legend known for his “crooked hat”. Barry has tagged 3 Boone & Crockett whitetails with traditional bows and was the first hunter to kill a whitetail with a bow on production video. Gene Wensel – Needs no introduction. Legendary author of multiple whitetail books and renowned seminar speaker. Bobby Worthington – Has had more monster bucks profiled in North American Whitetail magazine than anyone. 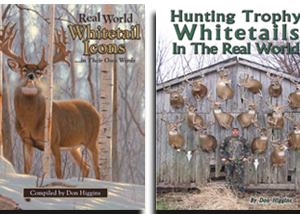 In addition to these 12 whitetail icons, Don Higgins included 3 of his own chapters at the end of the book. The finishing touch comes from wildlife artists Hayden Lambson and Jim Hoker. Hayden’s paintings and Jim’s drawings appear throughout the book to further stimulate the reader’s imagination. Be sure to get your copy of Real World Whitetail Icons… In Their Own Words and prepare to be educated and entertained. It is a keepsake that you will want to pass down to the next generation of whitetail hunters in your family.